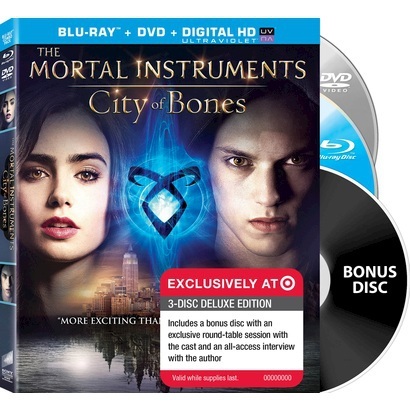 We’re just two days away from the Blu-Ray and DVD release of The Mortal Instruments: City of Bones on Tuesday in the U.S., and there are a couple of special editions you can purchase. We already told you about the Walmart special edition, which includes a rune medallion necklace, and now we have word of a special edition at Target. The Target 3-disc edition includes a bonus disc, which features “an all-access interview with the cast and author Cassandra Clare.” It’s available at Target for $26.99. Which special edition City of Bones Blu-Ray/DVD set will you be purchasing? Target? Walmart? Both? I’d like to get all the bonus material, but these region 1 discs won’t work on my computer, that’s a pity,but what can you do. I’ll probably ask someone among my american friends to buy it, screen-record the interesting stuff and upload it on some server for me. is it jsut me or are jace and clary’s eyes THE EXACT SAME COLOR on the DvD? i always, ALWAYS get special edition for my most favorite films!! there best be one of these for the UK its not fair the US gets more special things included than others:(, there not the only fans HELLO? ahah fingers crossed! I wonder if this will be available in Canada somehow? We have Target stores but not an online store. And Target.com only ships to the US. The Vampire Diaries: The Complete Second Season (Limited Edition with Exclusive Q&A Bonus Disc) | Your #1 Source for Movies & TV Shows in DVD, Blu-ray & Instant Videos!